For GamersOrigin’s seventh anniversary, we offer you a series of four articles that will come back on the start-up’s history. You can read the second article below, and find the previous one by clicking here. In early 2016, GamersOrigin is a Twitch channel, a network of Youtube channels, a tournament producer and a Hearthstone eSport club all at once, without any extension to other games yet. The arrival of Overwatch and the excitement surrounding it soon spreads to eSports amateurs, and GO is no exception. GamersOrigin decides to go for it and enters the Overwatch scene in June 2016, by recruiting the Broverwatch team. GamersOrigin opens up to a new audience that wasn’t interested in Blizzard’s card game. This Overwatch team is not connected to any media and doesn’t produce any content: unlike Hearthstone players, it is entirely dedicated to training and competition. Still a Twitch channel is created, but it doesn’t concern the pro players. Roster changes happen again but do not put the brakes on the line-up, quite the opposite in fact. GO retains the title of French number one, and often puts itself in the European top 10, even remaining in fifth place for a while. In the BnBs, it was quite the adventure for the BootCamps. We made it so we could be 7 in a BnB for 4, we slept on mattresses on the floor, it was a complete mess. But that allowed us to be together and have amazing times, which is so important for team cohesion ! The “NoMercy” roster is recruited as a women’s team. Coached by Daemon, they take part in LANs alongside the boys, sporting the GamersOrigin jersey and tag. This adventure ends with the team disbanding, but it still allowed to shed light on talented female players in a field leaving little place to women. The Hearthstone club, however, gets a lot more energy, with the entrance of Ruben “Chinoize” Trong and Louis “Mitsuhide” Bremers on November 5th, 2016. The two dutch-speakers are young players with strong potential: for instance, Chinoize won the 2016 DreamHack Tours. Their arrival renews the Hearthstone line-up with players who would be able to get to the top of the European scene. 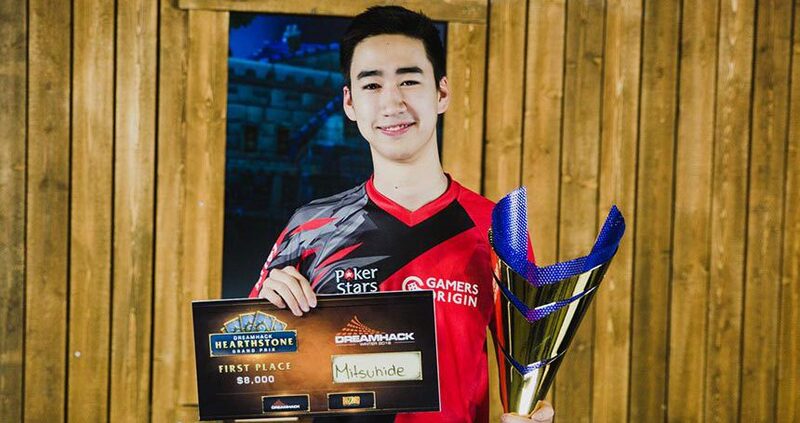 Mitsuhide proved only three weeks after coming in that the hopes formed around him were founded by winning the DreamHack Winter, allowing GO to keep the title, previously acquired by Purple a year before. For his part, Un33d managed to secure the event’s top 4, with a Warrior mirror match where he showed how strong his mind game was. 2016 allowed GamersOrigin to open up to a new side of eSports, when the structure would only ever work around Hearthstone. Even though it only remained on Blizzard games, the Overwatch section gave the club a new dimension that welcomes new sponsors and partners for its teams. At that time, GO had almost no resources to get to LANs, and when we decided to get to our first international LAN, it was for the Insomnia 58 in Birmingham, where we ended up in second place behind a pretty strong UK team. The journey had been epic, we left Paris in two cars, to move the entire team and the 6 PCs and screens, we travelled for more than 12 hours since we had been stuck on the border because of a suspicious truck, then in England there was a heavy downpour, we couldn’t see anything and we were driving super slow… Anyway, once in Birmingham everything went really well for us and we got back home super happy of this trip and confident about the future of the team! Discover the next chapter soon on our website!